Poachers, goal-getters, hitmen, foxes in boxes or marksmen – the alias may vary from team to team, though the job invariably remains the same. Every club competing in this season’s Championship has a game-changing talisman among their number. The luckier teams have a few of them. Brentford’s Neal Maupay is the Championship’s current top goal scorer with 13 goals, just ahead of Nottingham Forest’s Lewis Grabban who has found the net 12 times. Below Maupay and Grabban is a clutch of players on 10 goals each – Tammy Abraham, Lukas Jutkiewicz, Billy Sharp and Teemu Pukki have all made it into double figures for the season. This weekend, the Championship’s line leaders and goal poachers will be hoping to boost their numbers further. Let’s take a closer look at a few of the players worth keeping an eye on in the anytime goalscorer markets in the Championship on Saturday. Make sure to check out all of our expert match previews, predictions and betting tips for all this weekend’s Championship fixtures here. In the Championship’s early kick-off on Saturday, promotion chasing Sheffield United and Leeds lock horns at Bramall Lane, with top spot potentially on offer for the victors. With both teams in good form coming into the top of the table clash, Saturday’s contest promises to be a keenly fought affair. Chances might well be at a premium in Sheffield and both teams’ attackers will have to be at their clinical best to have an impact on proceedings. 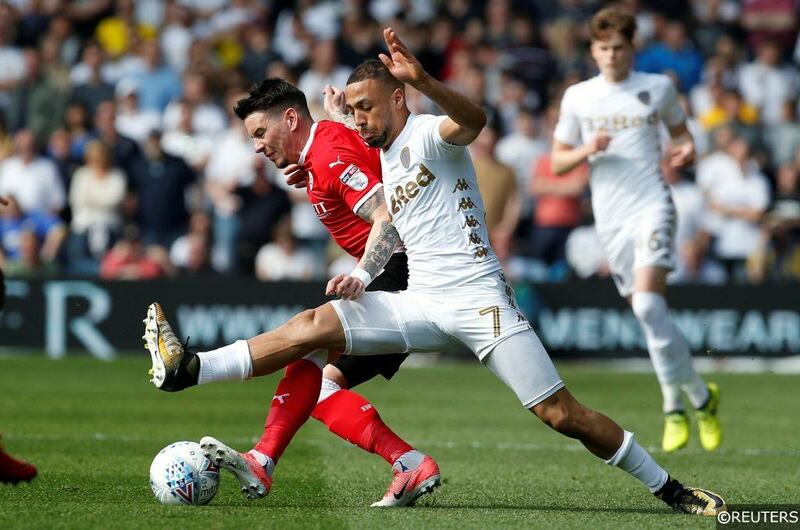 Leeds’ Lemar Roofe is enjoying a fabulous individual campaign in 2018/19 and the 25-year old is thriving under the management of the eccentric Marcelo Bielsa. Roofe is Leeds’ leading marksman this season with 8 goals, and the versatile forward is currently on a scoring run of 4 in 6 games for United. Roofe has a wonderful habit of chipping in with goals at vital times, and he’s priced brilliantly at 7/4 with bet365 to get on the scoresheet in another big game on Saturday. Blackburn Rovers haven’t won in 3 Championship games ahead of their clash with Sheffield Wednesday at Ewood Park on Saturday. Rovers continue to languish in mid-table, though they remain one of the toughest teams to beat on their own patch in 2018/19. Blackburn have lost just 1 of their 9 league matches at Ewood Park since the summer, and on Saturday they take on a Wednesday side who have lost 2 and drawn 1 of their last 3 matches on the road. 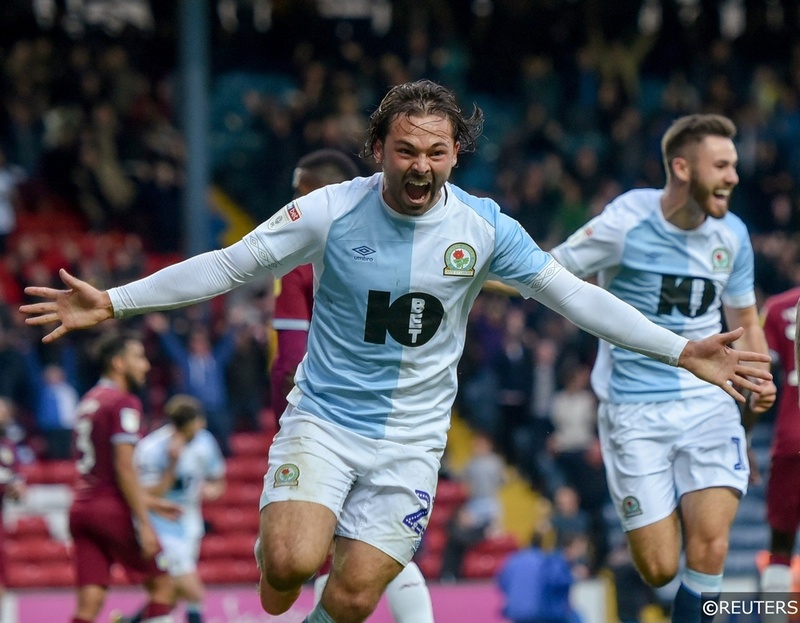 Central to Rovers chances of victory will be their match-winning attacking midfielder Bradley Dack. The 24-year old is Rovers’ top scorer in the Championship this season with 8 goals, and 3 of the last 4 goals he scored were registered at Ewood Park. Our expert analysts have tipped Blackburn to beat Sheffield Wednesday relatively comfortably on Saturday, and Dack is priced brilliantly at 11/8 with bet365 to score anytime against the Owls. With 6 wins from their last 6 Championship games, the Canaries are absolutely soaring at the moment. Norwich are currently perched at the summit of the table, though they will need to keep stringing victories together to hold of Leeds who sit just a point behind them in second. City’s results at Carrow Road had been a little patchy at the start of the season, however, Norwich have won 5 of their last 6 in East Anglia. The Canaries are tipped to extend that positive record against a Rotherham United side who have won just once in 12. The Millers are still waiting for their first away win in the league this season, and Rotherham have kept just a single clean sheet in an incredible 33 Championship away matches in a sequence stretching all the way back to April 2016. Any striker worth his salt would fancy their chances of hitting the net against such a porous defence, and Norwich’s Teemu Pukki will be at the front of the queue to grab a goal on Saturday. Puuki has scored 5 times in his last 4 Championship appearances and he is priced at 10/11 with bet365 to score anytime against Rotherham this weekend. Aston Villa have been an exhilarating team to watch in recent weeks and their last trio of matches in particular have been stunningly exciting, goal bonanzas. A total of 19 goals were scored across the triple footballing feast that the Villains served up, and their 5-5 draw with Nottingham Forest on Wednesday will go down as one of the most enthralling Championship fixtures in the league’s history (Check out our guide on where to find the goals this weekend). 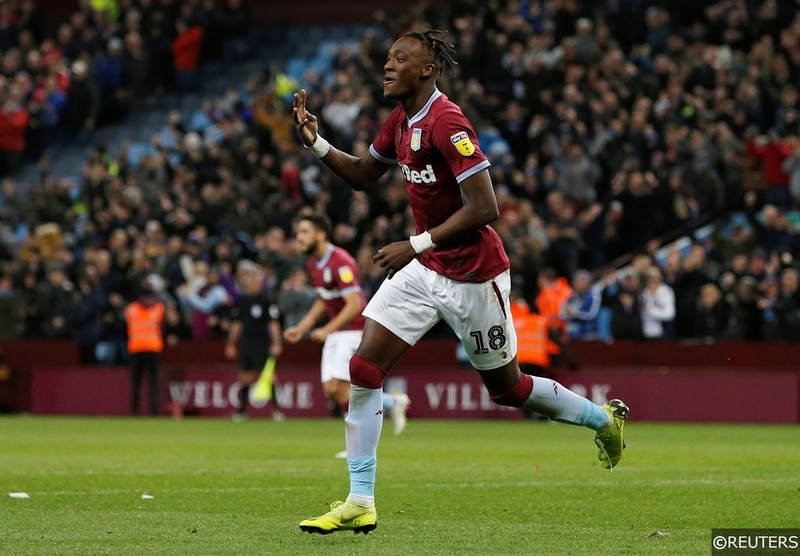 Villa striker Tammy Abraham has been making the most of the penalty area drama. The Chelsea loanee helped himself to 6 of the 12 goals Villa scored against Derby, Birmingham and Forest respectively. Aston Villa’s game at Middlesbrough on Saturday evening isn’t expected to be quite as dramatic, though Abraham will still be backing himself to score after his scintillating recent performances. 2 of the 20-year old recent 6 goal haul were scored from the penalty spot, and Abraham will be Villa’s designated taker again this weekend. Bet365 have priced the youngster generously at 6/4 to continue his goal scoring streak on Saturday. Playoff candidates Nottingham Forest can keep the pressure on the teams above them in the Championship with a win over bottom side Ipswich Town at the City Ground on Saturday afternoon. The Tractor Boys make the 3-hour trek to Nottingham having won just 1 of their 19 Championship games in 2018/19. Unsurprisingly, Ipswich have the worst defensive record in the division and their porous backline looks ripe for plundering again this week. Forest’s Lewis Grabban is been in electric form since the summer, collecting 12 Championship goals in total since the new campaign got underway in August. Remarkably, 8 of those goals arrived in Grabban’s last 8 Championship starts and the 30-year old has scored 100% of Forests goals in their last 3 matches at the City Ground. Grabban will be itching to add to his tally for the season against the Championship’s most ramshackle rearguard, and bet365 have odds of 5/6 on him scoring anytime against Ipswich. Our Championship analysts are tipping both Nottingham Forest and Ipswich to score on Saturday. Make sure to check out our high probability BTTS fixtures from the rest of the weekend’s football here. Categories: Blog and Football. Tags: anytime goalscorer, Bradley Dack, Kemar Roofe, Lewis Grabban, Tammy Abraham, Teemu Pukki, and The Championship. Team Tag: aston villa, Blackburn Rovers, leeds united, norwich city, and Nottingham forest. League: England Championship. Sports: Football.